McCar Homes is pleased to announce the grand opening of the model home at its newest Greenville community, The Valley at Tanner Estates. Tanner Estates, a 103 home community located within close proximity to I-385 and I-85, features an array of home styles priced from the mid $200,000s. Greenville new home shoppers are encouraged to tour the model home, the Pembroke, one of the homes in McCar’s popular Registry Collection, to see first-hand the beautiful homes and superior features available at Tanner Estates. New home buyers will find everything they are looking for and more at Tanner Estates such as the traditional floorplans with plenty of flowing space, bonus rooms, large kitchens and upgraded fixtures and features such as tiled bathrooms and kitchen backsplashes, hardwoods and more. This new community will offer a wide range of home styles and floor plans to homebuyers including ranch, two- and three-story homes with up to 4,000 square feet. In addition to the close proximity to major roadways, homeowners at Tanner Estates may also enjoy the Junior Olympic swimming pool, tot lot, cabana, and sports court located within the community. 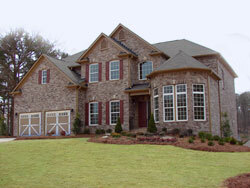 This entry was posted in Greenville new homes, South Carolina and tagged Greenville, McCar Homes, Tanner Estates on December 27, 2007 by Carol Morgan.